Expressionist painter Ben Mosley is fast becoming one of the most highly regarded artists of the paint medium, powerfully manipulating his own style of abstract impressionism to capture the drama and passion of sport, music and city life. An international artist whose work hangs in private collections around the world, Mosley has also been commissioned by leading organisations including Wembley Stadium, Manchester United and ITV to produce original artworks. Ben Mosley was born in 1981 in Hertfordshire, where he completed his Diploma in Art Foundation in 1999. In 2003, he graduated with a BA in Fine Arts from the University of Liverpool. Like his predecessors in the expressionist genre, Willem & Elaine de Kooning, Franz Kline and Lee Krasner, Mosley values spontaneity and creates his images by stroking paint directly onto each canvas in a gestural fashion. His oeuvre also bridges figurative and cubist styles, seeking to convey the explosion of energy that occurs in everyday life. Mosley describes his brushwork as gestural, angular and vigorous as he aims to capture the dynamism, excitement and movement of the environment around him. "To mark make is a necessity I undertake each time I create a new piece of art, a journey that I want to overcome and each new painting is a challenge. When my brush touches the canvas for the first time I become a composer of shape and pattern. I sculpt and mould images, and build form through the exaggeration of shape and pattern that convey my passion for the moment. The sense of losing control and letting go to gain control is a method I use frequently." 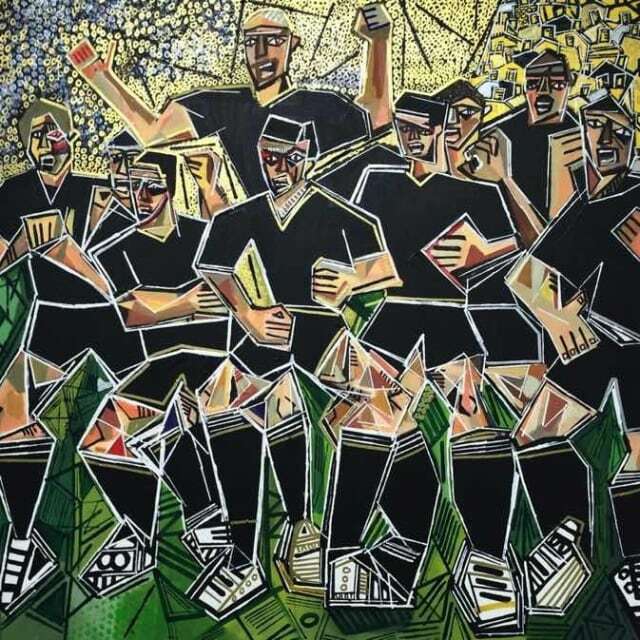 Since his early career, Mosley has deployed his own brand of abstract expressionism to powerful effect to capture the drama of sport, most notably football. One such moment Mosley has repeatedly returned to is the singing of the National Anthem, which he views as highly emotive and symbolic. His first solo exhibitions included ‘The Beautiful Game’ in 2006, followed three years later by the much celebrated ‘A Sporting Life’. Success in London led to Mosley’s work being televised on ITV, ESPN, the BBC and Premier League TV, where he once painted live on television. Mosley’s reputation as the footballers’ artist was further cemented in 2011 when he became the first artist to paint a mural at Wembley Stadium. Documenting the transition from the Old Wembley to the New Wembley Stadium, the mural celebrates the ground’s history since 1923 and stretches over an area of 20m. As Artist in Residence, he exhibits a further forty paintings in a permanent collection inside Club Wembley. As a formidable live action painter, Mosley has produced live artwork at huge sporting events such as the FA Cup semi-final between Manchester City and Chelsea. In 2012, he worked live at the Queen Elizabeth Olympic Park to foster a bond between his art and the athletes. In doing so, his artworks effectively represent the unfurling action and emotion. Mosley has also been asked to paint live at a Manchester United Gala Dinner, and at The Dubai Desert Classic in Dubai, where he was officially commissioned by the Emirates Golf Club to produce a painting celebrating their 25th Anniversary. Such events have raised over £200,000 for charity. In 2014, Mosley was commissioned by McDonald's to represent the UK at the FIFA World Cup in Brazil. His painting ‘Fans of the World’ was chosen to adorn the fast food giant’s iconic fry boxes in a global promotion and was seen by over 60 million people worldwide. That same year, McDonald’s also commissioned Mosley to create a live painting at their World Cup celebrity launch party in New York. As well as sport, Mosley has a keen interest in depicting architecture through shape and pattern. Combining mono-printing techniques with contemporary methods of painting to create his individual style, his works bring the movement, atmosphere, energy and character of cityscapes to life. Recently, he has exhibited his works in solo exhibitions stretching from London to Austin, Texas, and appeared at the Barcelona International Art Fair in 2016.